I grew up in the South, so good barbecue is something I take very seriously. While this recipe may look long &complex, it is sooooo worth the effort (and really easy!) These may be the best ribs I've ever had -- and trust me...I've sampled a LOT of ribs in my lifetime. Stock up on napkins and get ready to enjoy! Mix the dry rub ingredients in a small bowl. Cut ribs into 3 or 4 rib sections, and rub liberally with the dry rub. Place in a large zip-top bag, and refrigerate 2-4 hours. Remove from bag, and place ribs in a large stockpot along with onion and garlic. Cover with water and bring to a full boil. Then, cover pot and lower heat to simmer, and let simmer for 45 minutes. Remove from pot and allow to cool. In a bowl, mix together brown sugar, ketchup, soy sauce, Worcestershire sauce, rum, garlic-chile sauce, mustard, and pepper. Coat ribs with sauce and marinate at room temperature for 1 hour, or refrigerate overnight. When ready to serve, preheat grill for medium heat. Position grate four inches above heat source. Brush grill grate with oil. Remove ribs from marinade, but RESERVE marinade sauce. Place reserved sauce in a small saucepan and bring to a boil. 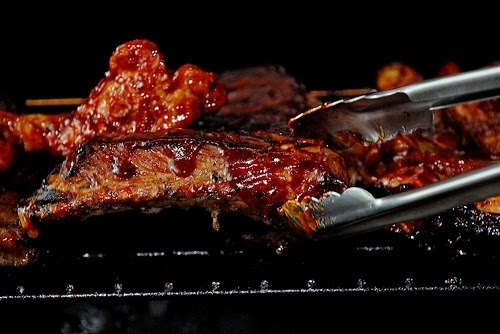 Put ½ cup of the heated sauce to the side to serve with the ribs; the rest you will use to baste the ribs on the grill. Place ribs on grill, and cook for 3-4 minutes per side, basting with reserved sauce…or just until heated through and slightly charred.